Whether you’re chasing cultural experiences, some relaxation and rejuvenation or just want to party for 48 hours straight, Siem Reap in the north-west of Cambodia is the destination for you! From temples, circus shows and bike tours to cute cafes, shopping and day spas, Siem Reap has a little something for everyone. While you'll want a whole lot longer, if all you've got is one weekend to take it all in, this is where you will want to start! Arrive in Siem Reap and check into Phum Baitang luxury resort. On the border of the Angkor World Heritage National Park, your new home away from home has serious jungle vibes with lush greenery, wooden features and plenty of water. With your own private pool, onsite cooking classes, two amazing restaurants and a couple of bars, this retreat is a slice of heaven. You’ll get a beautiful Monk blessing on arrival and gain some first-hand insight into Buddhist culture to get your trip off on the right foot. Finish the day with a session in the yoga pavilion. Congratulations, you are officially zenned out. Wakey, wakey! You may be completely zenned but you only have 48 hours and there is way too much to see. Grab your white singlet, camo pants (weaponry optional) and jump in the vintage war-era jeep your hotel has so kindly organised! Today you’ll be travelling through the Cambodian “outback” Lara Croft style. But before you head off, take a moment to relax and enjoy the sunrise, there is seriously no better way to start your day. Already craving a good Aussie flat white? Get your caffeine fix from The Little Red Fox, try one of their famous salmon bagels and give yourself a pat on the back for supporting one of Siem Reap’s green cafes who is working to lower Cambodia’s carbon footprint. We recommend dining in—takeaway coffee and four-wheel driving do not mix. Pick up your temple ticket day pass, travel to Angkor Wat and have your mind blown by the majestic architecture of this twelfth-century temple. Be sure to bring your selfie stick, go pro or personal photographer because this is one place you have to ‘gram. Grab a history book, tour guide or just explore at your own pace (with a fresh coconut in hand of course.) Just remember to wear something that covers your legs and shoulders! Get back in your jeep, you’re off to Ta Prohm a.k.a the Tomb Raider temple. Get ready to pose in pics with fans who mistake you for the real Lara Croft—seriously. This temple is filled with secret passages and alleys, which make for an epic game of hide and seek with your pals. Hit the road and drive through (yes, through) the epic temple Angkor Thom and hang as many body parts out of the vehicle as you want to risk on your travel insurance. This vine-covered gateway was quite literally swallowed up by the jungle for hundreds of years and looks like a lost city straight from the movies. Ensure you have your go-pro in position. Wanting to get in some holiday exercise? 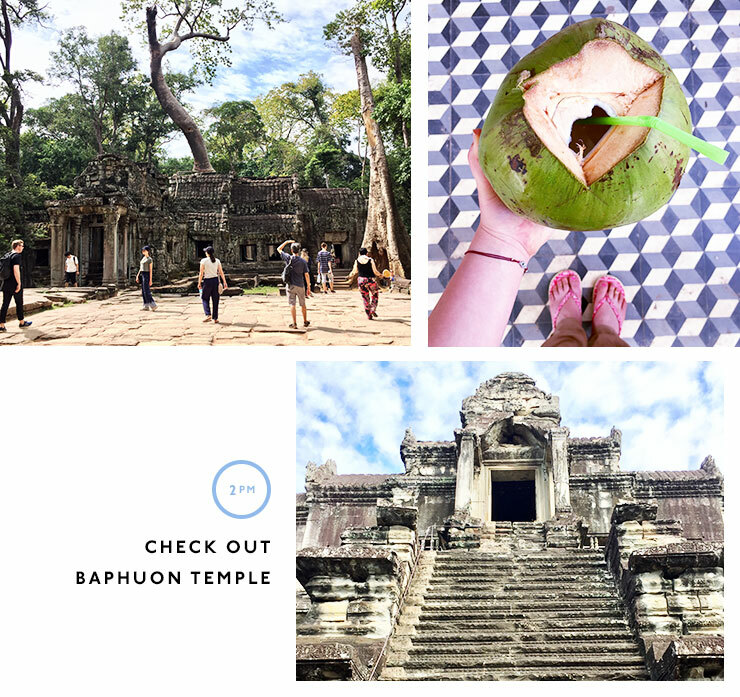 Check out Baphuon Temple. You will want to have good walking shoes because this is Cambodia’s version of Jacob’s Ladder. Trekking not your style? You can see the ruins from the sky in your private helicopter with Helistar. Massage time. You worked hard right? Visit Khmer Relief Spa and enjoy having your body smothered and massaged in mango and avocado scrubs. Dine at Cuisine Wat Damnak where authentic Cambodian flavours mix with French culinary techniques. With almost everything sourced from nearby farms and provinces, you’re guaranteed to enjoy a creative and delicious set menu that changes weekly according to the seasons. Sit up in the charming wooden second story of the restaurant to enjoy a dining experience that truly reflects the menu. Roll up roll up! The big top is calling. More than just a circus, Phare use theatre, music, dance and death-defying circus moves to tell a unique Cambodian story. Grab some fresh popcorn for only $1 and a fan (to either cool yourself or hide your eyes when the aerial action starts.) Don’t forget to snap a pic with the hunky circus stars after the show and throw a donation in the hat to help underprivileged arts students. It’s time to rise and shine. Say bye bye Jeep and hello Grasshopper Bike Tours. 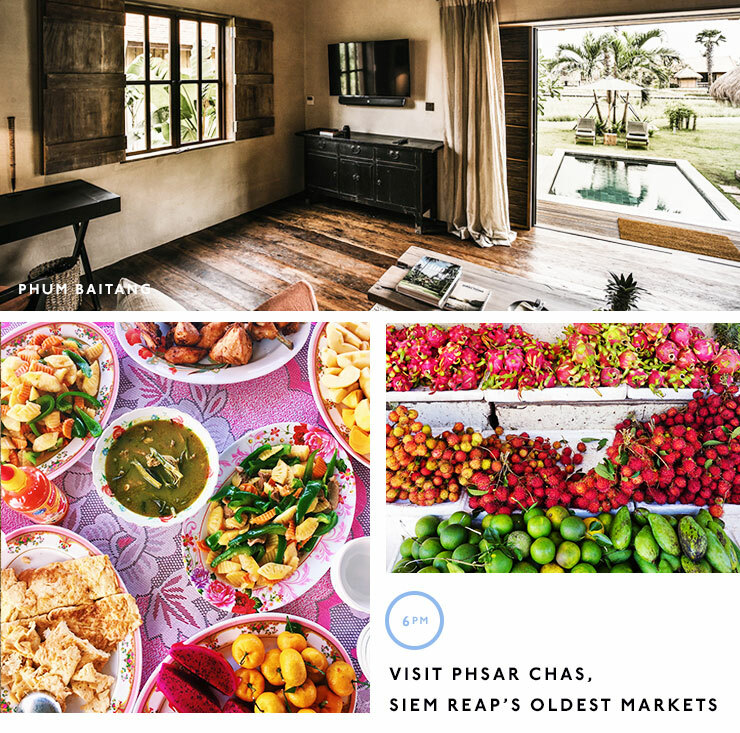 Your guides will take you off the beaten track to some of the best local spots in Siem Reap. Think crocodile farms, grass fields, local villages and markets. Let your guides treat you to plenty of fresh fruit, homemade doughnuts, rice snacks and just a whole lot of amazing tasting Cambodian treats which you will wish you could stuff in your suitcase. Plus there will be no other tourists in sight at these markets. Priceless. This is the perfect opportunity to get the low down on Cambodian life from a local perspective so make sure you have your questions ready. Now that you have cruised approximately 25 kilometres around the countryside, it’s time to enjoy a big all day brekky from Sister Srey. With the cutest decor in Siem Reap, you will feel like you could stay here all day long. Walk upstairs to check out the boutique gift store, grab a seat by the window, a book from the shelves and an iced coffee. Order one of the amazeballs acai bowls (for only $4.50!) or grilled bacon, spinach and poached egg potato hashes. Head to the war museum and get your history fix. Cambodia has a pretty dark past and while a visit to the museum is a pretty sobering experience, you'll learn a lot and that's what travel is all about. You can find a free guide to lead you through, many of who were war veterans, landmine victims and eye witnesses so they can offer you a heap of knowledge as well as their own unique perspective. Enjoy the five star Cambodian or European menu at the Heritage Restaurant including foie gras, lobster, gin and tonic granitas and kaffir lime mouse. Mmmmm. Catch some live music at Triangle Bar with the band performing old school classics and some newbies. Recline on one of the lush couches or hanging day beds and take in the atmosphere of Pub Street from above. The party ain’t over yet people (and if you are starting to get tired may I suggest an espresso martini?) It’s almost impossible to miss Temple Club on Pub Street. It’s a nineties and noughties dance party that’ll rival most Perth clubs. The doors and windows are all open with the party pouring onto the street and the vibe is ah-mazing. The place is filled with Khmer statutes and temple style podiums (hence the name) so grab your mates and pretend you’re Pitbull while grooving it up on the decks. Donate some of your clothes to organisations such as COFCO orphanage. Want more holiday inspo? How about 48 Hours In El Nido?